Camp Snoopy, Star Wars, The Muppets – what do these all have in common? These are all designs you can find on vintage glasses from the ’70s and ’80s. A Bon Appetite article (February 2019 issue) spots a new trend being set by bartenders. 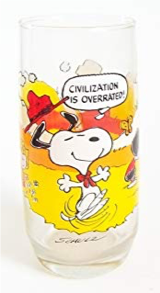 Multiple people in the article report that vintage decal glasses are appearing in bars and restaurants across the US. Great news for our industry, where this stuff often has its last gasp. So how do we identify these trends and promote them in our stores? Consider creating an Instagram account to browse current trends and influencers (people with a large internet presence and following). Here are some suggestions for home décor Instagram accounts to check out: ourspringhavenfarmhouse, houseofsaaj, jonescreekcottage. Another way to identify trends is to follow certain hashtags on Instagram. Examples could be #thriftedhome, #eclecticdecor, #modernrustic, #modernfarmhouse, or anything else that is applicable to the items that come through your store. 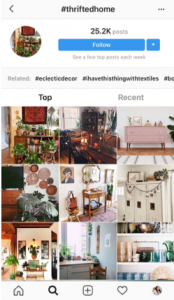 By following these hashtags, you can see what’s currently trending and gain inspiration for creating displays in your store. Did you know…that you can set up key word alerts through Google? Enter your email and words you would like to get alerts from at this link, and you’ll be able to receive daily notices. This is particularly helpful if you happen to get multiples of an item donated to your store and are interested to see how people are talking about that item. Using Google Alerts enables you to quickly see and respond to trends with the materials you have. Another social media tip: take pictures of your setup and use the editing tips from the blog last week (you can click here) and post them on Instagram and/or Facebook using the above hashtags for people to find. If potential customers see your setups, they’ll be inspired to replicate it and stop by your store. Stay tuned for the Part 2: How to Set Your Own Trends, coming to the blog next week!